Poet Hala Alyan, whose Three Rooms Press poetry book, Atrium was awarded the 2013 Arab American Book Award in Poetry, will join Kiese Laymon, Nina McConigley, Shara Lesley and Ryan MacDonald in the Lone Mountain Readings Emerging Writers Festival, March 24-25 at the University of San Francisco. Atrium has received high praise from many notable poets. Her work has appeared or is forthcoming in The Missouri Review, Columbia Poetry Review, and Prairie Schooner. She is a clinical pyschologist and resides in Manhattan. 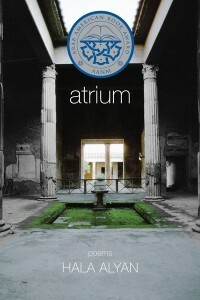 For information on where to order a copy of Atrium click here.